La Sabotiere is a riverside holiday detached house with 2 accommodations. Le Nid is a groundfloor apartment, on 50 m2, (one bedroom, living room, kitchen) with garden and terrace, lovely view, and situated in the heart of the pretty village of St Nicolas des Eaux. 18 kms from Pontivy and 40 kms from the west coast. Perfect place for relaxing, fishing, canoeing, walking..
*French windows leading onto the front garden which overlooks the river. *Galley kitchen, fully equipped including dishwasher, washing machine, microwave/fan oven. Behind the house or inside the property. You have the choice. In renovation, hope it will be ready for the next season ! Well appointed riverside apartment in a picturesque village. Three bars and places to eat within walking distance. If you like walking there's plenty of local routes. If you like fishing it's on your doorstep. Merci pour confirmer les 4 étoiles qui m'ont été attribuées par le ministère du Tourisme ! Nous nous efforçons de proposer des lieux agréables, bien équipés, Vous l'avez remarqué et, j'en suis ravie ! La Sabotiere is a beautiful cottage in a beautiful village - St. Nicloas des Eaux. The cottage is very comfortable, clean, cozy, very well equipped. 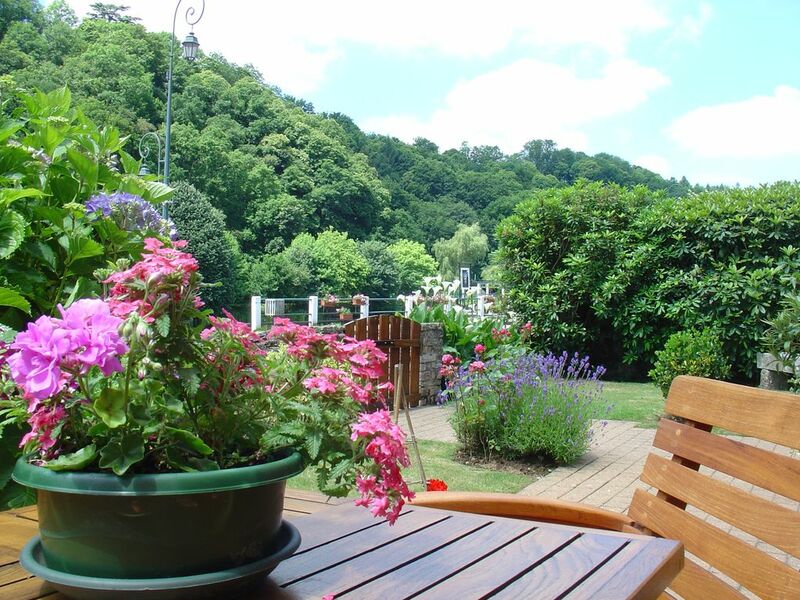 It's lovely to sit on the terasse in front of the river. Arlette and Roger are such nice hosts, caring, attentive. They really made us feel at home. We highly recommend La Sabotiere for a peaceful, calming vacation! Die ist ein seh schönes Ferienhaus mit herrlicher Umgebung. Es war alles vorhanden. Die Vermieter sind sehr nett und bemüht. Ich kann dieses Haus nur weiter empfehlen ! Merci Elke pour votre gentil avis. Nous faisons de notre mieux pour proposer un logement confortable et veillons après chaque départ à ce que les vacanciers qui arrivent trouvent un habitat impeccable.